What’s the most important equipment for playing racquetball? Many might say it’s the racquet, but we believe it is the goggles. Racquetball is a game of fun and extreme competition, but is there any fun worth taking the risk of hitting your eyes with a ball running at 100 mph speed? The answer is simply no. 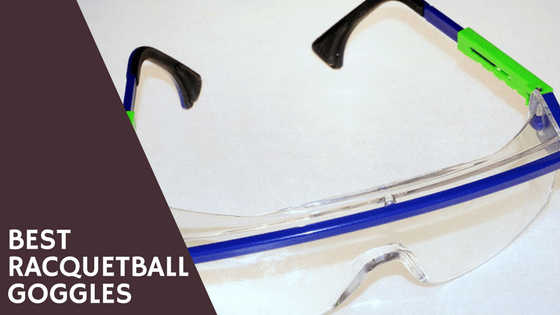 That’s why it has been made mandatory to wear the best Racquetball goggles whenever you’re playing a friendly match or a tournament. In fact, the USAR has a specific requirements for what kind of eye goggle you should wear during matches. Goggles are such gear that is very cheap and simple, yet necessary. And don’t think they are not an aid for your styling sense. Modern Racquetball goggles come in stylish design and advanced properties like vented lenses, anti-fogging and lightweight frame. 1. Pyramex Fortress Safety Eyewear. The Pyramex Fortress Safety Eyewear has rubber coated temple tips go straight back and prevent the sweat to insert and hinder vision. The side arms are well fitted and applies slight pressure to ensure they stay in place. The goggles come with vented lens. Which means they allow the air to circulate between lenses to prevent the fog from forming. The eyewear comes with an adjustable nose pad. Although this is a dual lens goggles, the nose pad provides a good fit for a wide range of bridge sizes. Pyramex Fortress Safety Eyewear lenses are anti-scratch, which means they do not wear off easily. It also offers brilliant protection form UV rays. Vented lens prevent from fog forming. Adjustable nose pad. Good fit for wide range of bridge sizes. Brilliant protection form UV rays. One of the best racquetball eyewear on the market praised by its users. The goggles come with 400UV protection, which means they can prevent 99%-100% UV-rays to come in contact with your eyes. The 400 refers to the highest wavelength of UV rays. The eyewear is 3.1 inches wide and 2.4 inches high. The lens are made of polycarbonate. They are lightweight, sturdy and scratch resistant. Not only for Racquetball, usable for outdoor activities like cycling, swimming, running etc. The non-tinted lenses offer distortion free, clear visualization. The lenses are 10 times more impact resistant than plastic lenses. Provides effective protection against dust, leaves and branches. The anti-slip legs along with a molding, rounding frame ensures that there’s no sudden falling off of the goggles. The product comes with gift wrapped. If you intend to gift your loved ones something useful, the J+S Active PLUS is an excellent choice. Additional policies like manufacturer warranty and money back guarantee makes it even more secure purchase. 400UV protection, which means they can prevent 99%-100% UV-rays to come in contact with your eyes. 3.1 inches wide and 2.4 inches high. The lens are made of polycarbonate, therefore lightweight and scratch resistant. The lenses are 10 times more impact resistant than plastic lenses. Non-tinted lenses, so distortion free and clear visualization. Usable also for outdoor activities like cycling, swimming, running etc. Provides effective protection against dust, leaves and small dirt. One of the popular products on the market. The BSN Overglass Eye Protector Eyewear comes with both quality and strength. The specialty of all BSN eyewear is that they are approved by USRA. Also, they have come through the impact testing process and meet the requirements of ASTM F803. The lenses are made of blue poly-carbonate. Also, they come vented so that the player can see the Racquetball clearly. This is a single lens eye wear that is stronger than plastic. The goggles come with cleaning pouch. Which means it’s also easy to keep protected. The lenses are anti-fog and don’t get affected by scratches much. Well known for quality and strength, approved by USRA. Also, meets the requirements of ASTM F803. The lenses are made of blue poly-carbonate, ensuring clear visibility. Single lens eye wear so it is stronger than plastic. The lenses are anti-fog and don’t get affected by scratches much. ​Head is known for making quality Pickleball, Racquetball and other racquet sports equipment. No wonder they provide quality goggles for Racquetball. Power Zone Shield Protective Eyewear is their single lens eyewear that comes with both quality and beauty. The racquetball eye guards come with modifiable temples with rubber inset to provide a firm and comfortable fit to the user. The single lens is bigger than normal eyewear and provides the stability for a moving Racquetball player. The lens provide 99% UV ray protection. The goggle has an elastic rubber strap with clip on features. This provides additional feature along with anti-slip legs. The eyewear comes with additional cleaning bag which is good, considering it will stay protected when you’re not using it. The lens are made of polycarbonate and very lightweight. They are resistant to fog, scratch and sudden wear. The frame is soft, yet quite protective thanks to the shock absorbent brow bridge. The nose pieces are non-slip for comfort and fit. Single lens eye wear, comes with both quality and beauty. Temples with rubber inset to provide a firm and comfortable fit . The single lens is bigger than normal eyewear and provides the stability for a moving Racquetball player. The lens provide 99% UV ray protection. The goggle has an elastic rubber strap with clip on features. The eyewear comes with additional cleaning bag which is good, considering it will stay protected when you’re not using it. The lens are made of polycarbonate, so very lightweight, resistant to fog, scratch and sudden wear. ​One of the clean looking, quality goggles on the market that is loved by users. The Ektelon Strobe Eyewear is a single lens goggle with enhanced ability of anti-fog, clear vision. The vented lens is equipped with shield design to protect the sweat from running to your eyes. The impact brow bar makes the eyewear resistant to impacts. This is the ultimate anti-fog eyewear with several holes for better air circulation. The air flow doesn’t let the fog to be gathered and condensed. Usable by both men and women, this goggle comes in a cleaning pouch. The anti-scratch ektelon strobe protective racquetball glasses can serve the user for quite some time. Single lens goggle with enhanced ability of anti-fog, clear vision. The vented lens is equipped with shield design to protect the sweat from running to your eyes. The impact brow bar makes the eyewear resistant to impacts. it is a brilliant anti-fog eyewear with several holes for better air circulation. Brilliant design usable by both men and women. Comes with a cleaning pouch that can serve the users for quite some time. One of the main problems players face while playing Racquetball is dealing with the fog that gathers in their eye guards. That happens due to sweat and heat generating from the skin. Generally all manufacturers apply several anti-fogging coatings in their goggles. They work out well at first, but slowly the effectiveness decreases due to regular wear, interaction with sweat and being scratched off while wiping. That’s why, it’s better to keep several of them and replace them frequently without waiting for them to literally break. Also, you can use a sweatband on your head to prevent sweat going to your goggles. Some manufacturers came up with vented lenses to deal with the fogging problem. They are actually small pin holes in the top corner of the lenses. What they do is increasing the air circulation between the lenses so that the mist does not develop. We have a small tip though to do that air circulation naturally. Do not press the goggles too near of your eyes. Rather, keep a distance and move them closer to your nose tip. This generates more chance of air circulation. There are two types of goggles based on the number of pieces of lens. One piece lens and two piece lens. The latter comes with separate nose pads. The single piece lens are generally bigger and easier to keep on face. It comes down to the preference of the players. You can tell which one suits you after a run of trial and error. You don’t want your goggles falling off during a rally, because that almost means you’d lose the rally for sure. That’s why, having extra layers of security is good. Although many eye wears come with strong side arms, having an elastic strap ensures no sudden hindrance during the game. Who doesn’t know the harmful effects of UV rays, right? Eyes are one of the most sensitive parts of the body. That’s why protecting the eyes from direct sunlight and UV rays are good, especially when you’re playing outdoors. Good news is, almost all manufacturers come with goggles that have UV ray protection these days. Importance of protecting your eyes during a racquetball game cannot be expressed with words. To get the best value in return of your money, goggles need some very simple maintenance for longevity and proper usefulness. The basic maintenance is to always keep it clean. The cleaner your goggles are the better you can see during your game. Goggles may get dirty from sweats or dusts during a play. Specially after using a couple of months it is very common with all goggles that the lens gets gloomy or hazy. How you are gonna clean mainly depends on the material from what your goggle is made from. Usually goggles are very easy to clean off. Regular wiping after every use with a small clean cloth is a good practice. Also store on a proper case to save from scratches or any other pressure while keeping on your bag or while carrying them. Lens area of your goggles should be always kept clean for best view. If your goggle is made up of plastic or fiber glass, you can simply rinse off with water & liquid soap, use a small soft clean piece of cloth to wipe and that’s it! If your goggle has metals on the frame, then you should try to avoid giving soap on the hinges as it may led to rust on metal parts. After every cleaning wipe off with a dry cloth so that no water stain mark forms. Many people avoid wearing goggles because they think it can hurt styling sense. With different manufacturers coming with new designs and styles, that is not a worrying issue anymore. Protecting your eyes has become synonym of smartness of your face. With this issue being solved, never compromise your security of eyes. Whether from a running Racquetball ball or the UV rays emanating from the Sun. Go for the best Racquetball goggles, because they won’t cost you much. Also, consider keeping several of them so that you can change them the moment you feel they’re wearing off. Enjoy the game without compromising your protection. 6 Best Badminton Shuttlecocks in 2019 – Top Branded! 5 Best Badminton Racket for Intermediate Player in 2019 – Expert Choice! 5 Best Badminton Racket for Beginners in 2019 – Guide & Reviews! 5 Best Badminton Shoes in 2019 – Expert’s Selections! © Topreviewlab.com 2019 | Topreviewlab.com is a participant in the Amazon Services LLC Associates Program, an affiliate advertising program designed to provide a means for sites to earn advertising fees by advertising & linking to Amazon properties including, but not limited to Amazon.com.